The Living Legend speaks to Rediff.com's Aziz Haniffa in an exclusive interview. 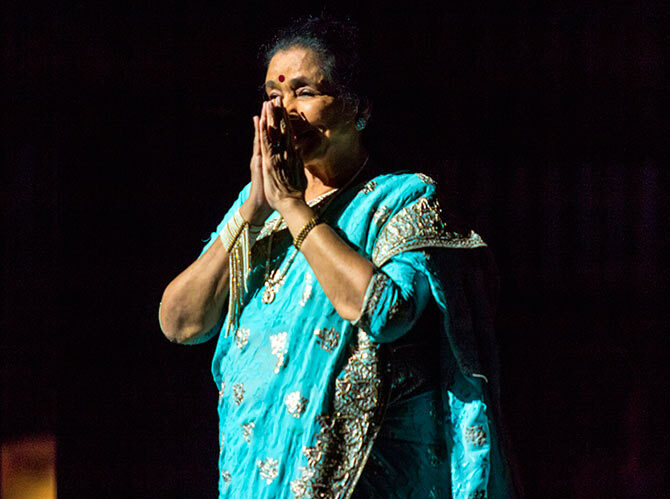 Legendary Indian singer Asha Bhosle performed recently at the Filene Centre at the Wolf Trap Foundation for the Performing Arts, Washington, DC. 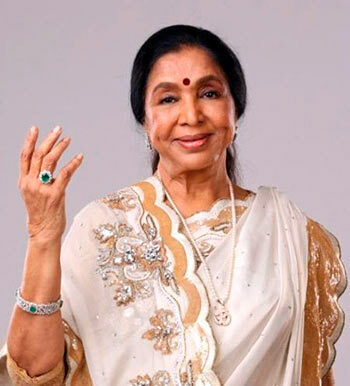 Ahead of the concert -- which was billed as 'The Farewell Tour' -- Bhosle, who will turn 83 on September 8, was her joyous self even as she revealed to Rediff.com's Aziz Haniffa her plans to say sayonara to singing. 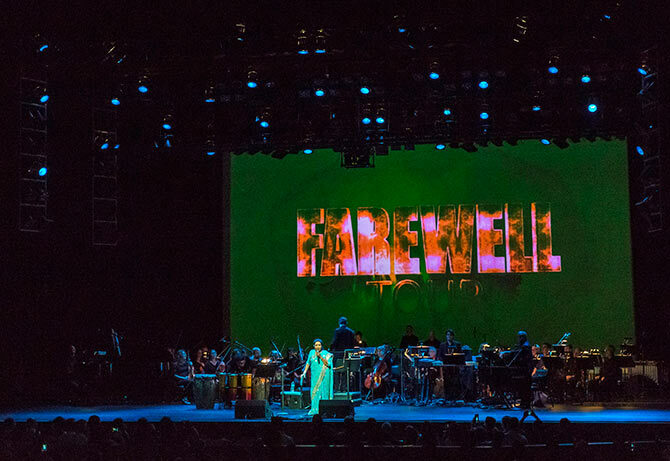 Your performance at the Wolf Trap has been billed The Farewell Tour. What happens after this tour? Does it mean that besides giving up touring overseas completely, you will also stop performing within India? 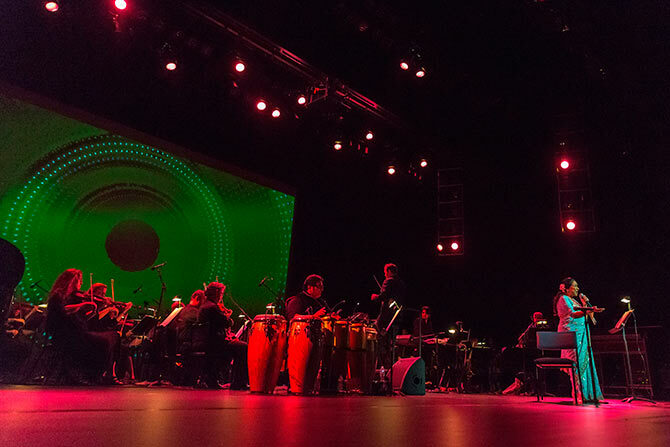 For the last 10 years, I haven't come to DC, since I performed at The Kennedy Center. But, yes, this is definitely my farewell tour and not only overseas -- it's going to be everywhere. I can't come here again because now I am 83 . So, yes, it is my last tour here and everywhere. You have toured the US several times before, performed at some of the major centres in this country, including the Kennedy Centre. What made you keep coming to the US? 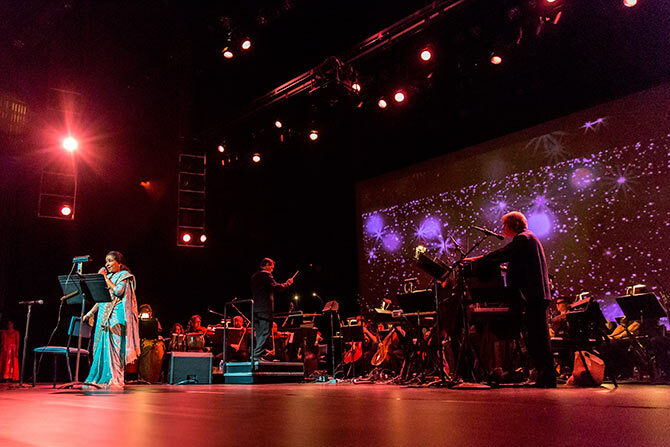 How would you describe the Indian Diaspora's continuing enthusiastic response to your performances over past decades? I have been singing for the last 72 years, so Indian people all over the world know me from their childhood. Even though they are here, they don't forget Indian music and my songs. I am with them always because in some ways, we grew up together. When I come here, they want to see me, I want to see them because they have been here for so many years, and for them, it brings back a lot of memories. It is nostalgia for them, about when they were young, when they fell in love and then for some, love and lost (chuckling). So they can remember all those things in their life. They can also remember India and they feel like they have been transported back to India. What is amazing is that you have endeared yourself not only to Indian/South Asian American communities here, but also to mainstream audiences. Many Americans, including longtime diplomats who have served in India, students, business people who have traveled and lived in India over the past several decades are your appreciative fans. What do you believe explains this? I don't know. Maybe because I am singing every style of Indian songs and language and mixing it up with the Western style also, and changing the voice and all that to suit the various styles. I have sung in all languages and so every people know me -- Gujarati, Punjabi, Tamil, Telugu. You know, I also recorded with Bathiya (Jayakody) and Santhush (Weeraman, the popular Sinhalese pop/rap duo in Sri Lanka, known as BNS) in Sinhalese in Colombo a few years ago and after that we did their show (their concert series Sara Sihina). I think American people also like to listen and dance to Indian music, especially Bollywood music. So they want to see that and hear the songs and that's why I think they also like my songs. You are 82 years old. How do you keep fit and find the energy to perform at this age, doing all this touring and stage shows? For this performance, you've just arrived from Dubai after touring in Australia and New Zealand, then you go to London and Durban and then back again to Dubai. What do you do to keep your vocal cords in such great shape? I love to travel. I like to meet new people and learn about their cultures -- new cultures. 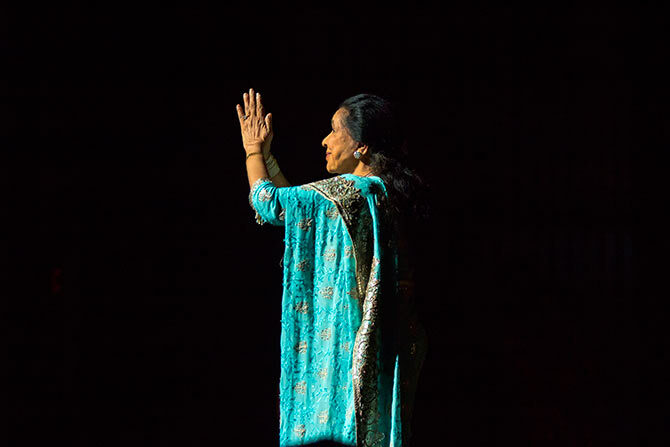 When I am singing, we are communicating through my singing and our common love for music. My voice, I am keeping well because every morning, I do classical music rehearsals, always training my voice. That's how I have maintained my voice because if you are not doing practice always, then your voice will go. Do you do anything like yoga to keep fit for these high-energy stage performances? I guess when you perform and get a positive and enthusiastic response and vibes from the audience, that probably keeps you young and feeling fit. Yes, yes (laughing). That gives me the will power to stay fit. I am always active... I am a musician, I am a singer, but I do every work in the house. I do everything for the children, the grandchildren -- they keep me very busy. How much of an inspiration was your father Pandit Dinanath Mangeshkar and your sister Lata Mangeshkar in your taking to singing from such a young age and then in your entire singing career that has spanned over six decades? Oh, my father, he was my guru. He is with me until now. Always, I feel he is with me,. 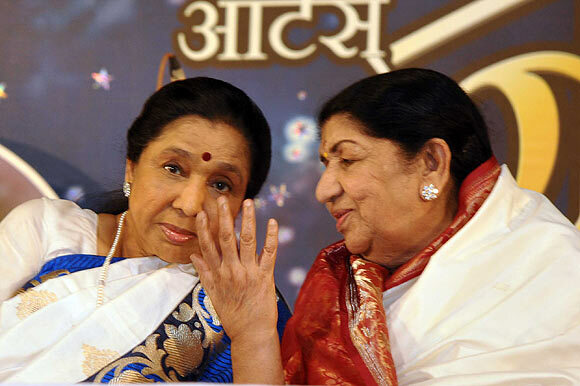 Didi (elder sister, Lata Mangeshkar) is also my inspiration but I did not copy her. I always did my own style because if I sing like her, then people, I don't think, will like that. I had a different style, a Western style. Anywhere I go, I will adapt that style. People say, 'Asha sing Bengali, Asha sing this and that' and I am singing like that. So you feel young. Makes me feel young. If you feel young inside and in the mind, then the mind is working your body and that makes you feel young. If you said, 'Oh, I am old, I am old,' then I will feel very old. Now, I am thinking I am 40 years old (she starts giggling, then laughs uproariously). Lata Mangeshkar sang Bollywood songs. Some were based on classical ragas, some were semi-classical, others light classical, following her training from your father. You started of sort of the same way, but quickly made your mark by fusion songs, and then songs with a Western touch, a mix of of light classical, which your sister would never do. Some people strongly criticised this as impure, contaminating Indian classical music and crass commercialisation. What made you do that and continue doing that? How would you counter such criticism? First, my base is classical -- Indian classical music, which my father taught us. After that, I was in the film industry and in films, I am singing so many styles of songs -- sometimes qawwali, sometimes cabaret, sometimes sad songs, a brother's song, a mother's song, a mother signing for her children or children and so on. I am singing all those kinds of songs. But classical is my heart. I like also so much Western and so I took on that Western style. I love Elvis Presley, Bill Haley... you know Bill Haley...? Yes, yes, I love Rock Around the Clock. I love these Western songs and singers. I love the beat and the rhythm -- it's so different. I used to mix it in my voice also and how I sing... Aaah! and Oooh! I tried all the time this and I always want to sing this style and that style. That's why my style is different. What about the people who criticised you for doing this? People criticised me very much at that time, but I think they are hypocrites because they liked those songs, they would sing those songs, they would listen to those songs, but they write all the time that she is singing bad songs and all that. I did not care about that. I don't pay attention to that. I had to survive. I had to take care of my three children. I had to work, I needed money at that time. So, I don't care about what people would say. I want to work, and I sang any song I got. I don't care about people judging me... I care about music and that is all I wanted to do. As the years went by, your versatility became even more expansive. As you became more popular as a playback singer in Bollywood, music directors experimented even more with Western instruments and different genres. You grew in popularity with the young folks, compared to Lata Mangeshkar who remained an icon with the traditionalists. What made you move from genre to genre so quickly? Because I liked all these different kinds of music. I loved jazz, I sang three to four songs in the jazz style. People liked that too. It was very new then at the time with the composer (and her second husband) R D Burman. He would do different styles and I would love that. Who were the jazz greats who were a big influence on R D Burman and you? Were you influenced by Dizzy Gillespie, Duke Ellington, Louis 'Satchmo' Armstrong and such legends? Yes, yes. We used to love all of them. I have listened to all of them -- every one of these musicians and singers. You mean Sammy Davis Jr, who was part of the 'Rat Pack with Frank Sinatra and Dean Martin? I know it's hard to point to just one or two songs or one or two films they were your favourites because you've sung thousands and thousands of songs (she is estimated to have sung over 13,000 songs), but can you name a few. Also, who was your best music director? This is very difficult because every music director, they give some good songs -- three to four songs. But they are very nice songs and every music director does that -- Madan Mohan, Jaidev, Shankar-Jaikishan, Laxmikant-Pyarelal, S D Burman. They all gave good songs. But R D was very different. His music was always ahead -- 40 years, 50 years (ahead). He was always ahead of his time and until now, he is popular like anything. Every music director copies him now. Every singer sings his songs on stage. So, he is a very popular music director (R D Burman died suddenly in 1994) and he has got a very different style. Madan Mohan also has a very different style. We, who are classical based, can sing everything more than others. When you hear the song, we understand it better. I have so many favourite songs. But again, I can't tell you and even movies, it is very difficult to tell you because there was so many. For many decades, Lata Mangeshkar, you, Mohammed Rafi, Kishore Kumar, Manna De virtually monopolised the Bollywood playback singing industry. True, you were all very talented and at the top of your game, but do you regret having such a monopoly where just a few artistes like you controlled the industry, a sort of exclusive club? No, we did not control... There was no singer like Lata, no singer like Kishore, Rafi, or Mukesh. And until now, there is nobody. Nobody with that kind of voice, nobody with that kind of brain to learn. Not only to learn, but to improvise. We improvised music, we improvised the songs. Nowadays, they just listen and copy. We would listen, and then we would be thinking what do we do with this song, how to innovate, how to improvise. Nowadays, people don't want to learn the correct pronunciation, all those things. We know that, but not the people now. We would improvise on the spot while singing and that's what made our songs so popular. Some people would argue that that monopoly is now broken in Bollywood. There are dozens of versatile singers. Today on television channels, they have music talent searches, young talent from villages and the inner cities of India have the opportunity to gain recognition and find a place in Bollywood's playback singing industry. Are you happy that the industry has become more diversified? Or do you feel the old traditions are being compromised? What about the talent you see on these television shows? Aren't you impressed by any of them? They are only singing our songs. They are listening to our songs more than 50 times and memorising and singing them. They are singing correct when they are singing them 50 times over. So I am thinking, they can copy, but they are not original. For them, it is just a business, this kind of singing -- copying and singing the songs. For many years Lata Mangeshkar and you were said to be estranged and had a strained relationship. I believe you are very close now, live together in Mumbai and have a loving sisterly relationship. Yes, we are very close now. We are sisters and you know, blood is thicker than water. Our bonds are very strong now. I am going to her place all the time and we are talking all the time and meet all the time, because we are living close to one another in Mumbai. Now that you are close to winding down your singing career and ending your touring, will you mentor young singers? Will you train them, help them come up with original songs or with improvisations as you did? I want to do that, but the new generation... they are very stubborn... they don't care if you tell them something. They will say, 'Okay, Okay, I know that' if I say don't eat curd, that it is bad for your voice. Or don't eat acidic stuff, it's bad for you, they will say, 'We will eat what we like.' So, they are like that. They don't want to spend time. They don't have patience. It is all about commercial for them.